Has shoulder strap. Inside dividers, film holders and outside front pocket. We do not cover this expense. We will cover the difference! Adjustable 2" wide shoulder strap make it conveniently to carry and multiple pockets optimize the usage of bag space. Material:waterproof canvas microfiber. 1 Shoulder bag(include Protection liner ). 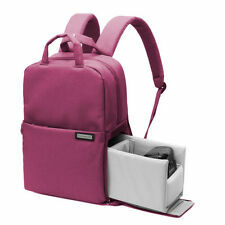 NEW Nikon Deluxe Digital SLR Camera Case - Gadget Bag for DSLR Camera. Condition is Used. Shipped with USPS Priority Mail. The 100ES is a serious bag for the traveling photographer. Anopen pocket on the front of the case provides an easy-access storage spot for accessories. Padded Divider. Adjustable velcro divider. Open pocket in the front. Multi-functional, Water Resistant for Sony, Canon, Nikon, Olympus, Lens Tripod and Accessories (RED). Made of high density durable nylon, waterproof and durable, all weather cover, easy clean and wash. This bag shows basically NO wear, & is EXCELLENT overall! LOTS of other bags available! Nice large front pocket with a hook & loop fastener closure for storing smaller accessories. CANON EOS Shoulder Bag 100ES For SLR Camera Black 9320A023AB. Condition is Used. Shipped with USPS Parcel Select Ground. CANON EOS Shoulder Bag 100ES For SLR Camera Black 9320A023AB. Condition is New. Shipped with USPS Priority Mail. It also can hold DJI phantom 1,2,3 Professional quadcopter. Removable and adjustable fastening taped & Padded customizable dividers. Padded Customizable Dividers: The fastening taped cushions inside the bag is removable and adjustable. Features:100% Brand new and high quality!A perfect combination for photo gear, it was designed specifically for digital photographers.Photo journalists and location photographers will find it a great travel companion.The backpack's reinforced construction, shock-absorbing closed-cell foam padding and tough, water-resistant outer durable waterproof Nylon protects contents from moisture and sudden impacts.The patented All Weather Cover offers maximum protection from extreme weather conditions, dust and sand.Zippered pockets provide photographers with fast, easy access to equipment.Thick & High intense Waterproof Nylon & Comfortable Rubber Hand StrapThis backpack has plenty of pouches (great for keys, cell phone, ipad and mp3 players), and large zipp. Digital SLR DSLR Camera Shoulder Bag Case LARGE Brown Padded Pack Backpack. Condition is Used. Shipped with USPS Priority Mail. DSLR SLR Digital Camera Case Shoulder Bag For NIKON CANON SONY. It can use for Canon 600D, D600, 7D, 5D2, 60D; Nikon D90, D60, D700, D7000. 1 * Shoulder bag for camera. Canon camera bag. With strap and buckle. New with tags. The best feature, however, is itsextra-large interior (18 x 7 x 10.5 in.). Whether you use this case for your digital SLR or camcorder, the Vivitar RGC-12 will hold all of your most essential accessories. (J 3 ( 10. Item arrived as described. Item Discription. ) 2017-10-18. ) 2017-10-07. SONY : a500、a550、a560、a580. CANON : 20D、30D、40D、50D、60D. NIKON : D70、D70S、D80、D90、D7000、D200、D300、D300S、D700. Optimized engineered dual density foams keep the bag light while protecting your tools. Protection for two lenses and a SLR body. Rear-facing zippered security pocket. 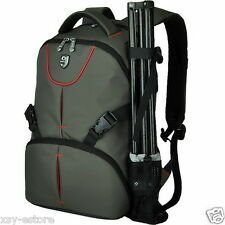 Canon Camera Bag for DSLR/SLR/TLR/Rebel/Other; Fits Lens and Other Accessories. Condition is New. Shipped with USPS Priority Mail. Great clothing item to add to your collection! Look good, feel good. Light,Handkerchief,Bag&Storage. Auto & Motor. Screen Protector. Auto&Motor. Motor Lighting & Indicators. Motor Accessories. Motor Handlebars & Mirrors. Motor Bracket Footrest. (although one was originally included, most people don't find a divider is needed or used in this bag). This bag shows VERY LITTLE wear, & is EXCELLENT overall! Exterior - Generously Sized Front Zippered Pocket (8"W x 6 1/2"T) which is secured w/a zipper.